Who really betrayed Julius Caesar? “Et tu, Brute?” – “You too, Brutus?” – is one of Shakespeare’s most famous lines about one of history’s most notorious moments, a retelling of the events of March 15, 44 B.C., when a group of Roman senators assassinated Julius Caesar as he attended a senate meeting. Readers of Shakespeare will know that these were the final words of a dying Caesar as he turned to one of the conspirators – and his best friend – Marcus Junius Brutus to confront him with his betrayal. 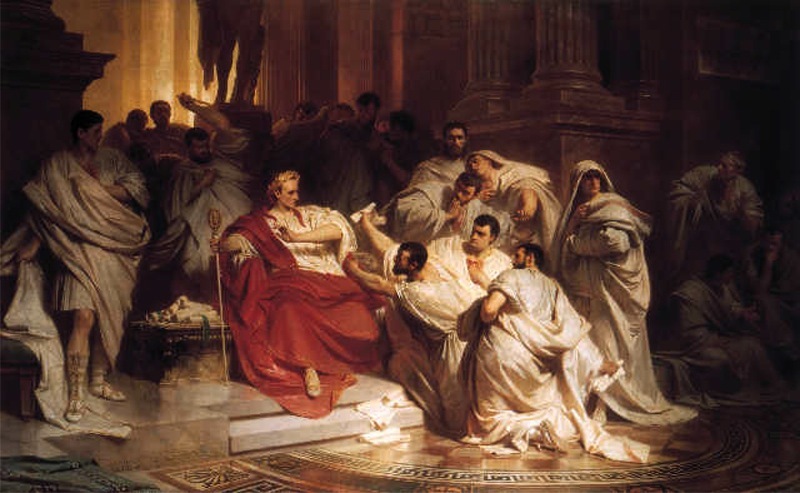 The dictator then died in a pool of blood, suffering from 23 stab wounds handed out by his closest friends at around lunch time on the Ides of March (a Roman term for the middle of the month). The events that followed would eventually lead to the dissolution of the entire Roman Republic, and change the course of ancient history forever. Except, as many historians will point out, Caesar never said these words. And, to top it off, Brutus was not one of his closest friends nor the source of his largest betrayal. So says Barry Strauss, a history lecturer at Cornell University and author of The Death of Caesar: the Story of History’s Most Famous Assassination, at least. According to him, another man closer to Caesar was more culpable: his closest friend Decimus. Largely ignored in Shakespeare’s Tragedy of Julius Caesar – his name is even misspelled as “Decius” – Decimus was a member of the Roman nobility whose grandfather had expanded Rome’s borders all the way to the Atlantic coast in Spain. His father was less well-regarded, though, and it was only when Caesar offered Decimus a place in his inner circle that his star began to rise. Decimus’s friendship with Caesar bloomed due to the deep respect he held for his superior, a famed commander and war hero, joining with his forces fighting in Gaul and winning a famous victory at Alesia – in modern day Burgundy – that secured Rome’s grip on the country. The civil war that threatened to strip Caesar of his power and consume Rome saw Decimus pick his friend’s side, winning a victories at sea off the coast of Gaul. Four years later, when Caesar was hailed with victory garlands on his return to Rome, Deciums rode at his side. So what happened? It is well documented how many of Rome’s senate feared Caesar’s power and tyranny, with his marriage and subsequent child with Cleopatra of Egypt too much for many traditionalists. But it seems that ambition rather than principal is what appeared to Decimus: many of his letters paint the picture of a man more concerned with honour than liberty. One notable incident saw Decimus denied his own triumph – or victory parade – in Rome, though Caesar rewarded him in other ways. Then came the rise of Caesar’s nephew, Gaius Octavius, not a soldier but a cunning politician, which drove a wedge between the two men. Decimus’ wife was also an ardent anti-Caesar figure. So, when in the winter of 44 B.C. Cassius birthed a conspiracy to rid Rome of its tyrant, his right-hand man Brutus whipped up several of Caesar’s inner circle with his rhetoric and intellectual prowess. Decimus joined the plot, as did more than 60 prominent Romans. Though Cassius and Brutus are portrayed – by Shakespeare and historians alike – as the masterminds behind the assassination, it was Decimus who held Caesar’s trust and really enabled the betrayal to take place. He accompanied the emperor to dinner the night before the event, and was sent to Caesar’s house the next morning when he decided not to attend the Senate meeting, probably because of the whispers of conspiracy around the Republic. It was Decimus’ powers of persuasion that saw Caesar attend the Senate meeting where he would eventually die, and who provided security to the killers by escorting the assassins to safety with his private troupe of gladiators, doubling as a private police force. They held a perimeter on the Capitoline Hill for the tense days that followed Caesar’s death. Decimus, meanwhile, fought for Rome in northern Italy before being betrayed in turn by Octavius, Caesar’s successor. He was abandoned by his troops, captured by his enemies and eventually executed in ignonamy.